I've had a busy time lately. Awesome, but busy. Today's the first day I've had to myself to sit down and catch up! The moment I get to Ponycon, though, it's all forgotten. 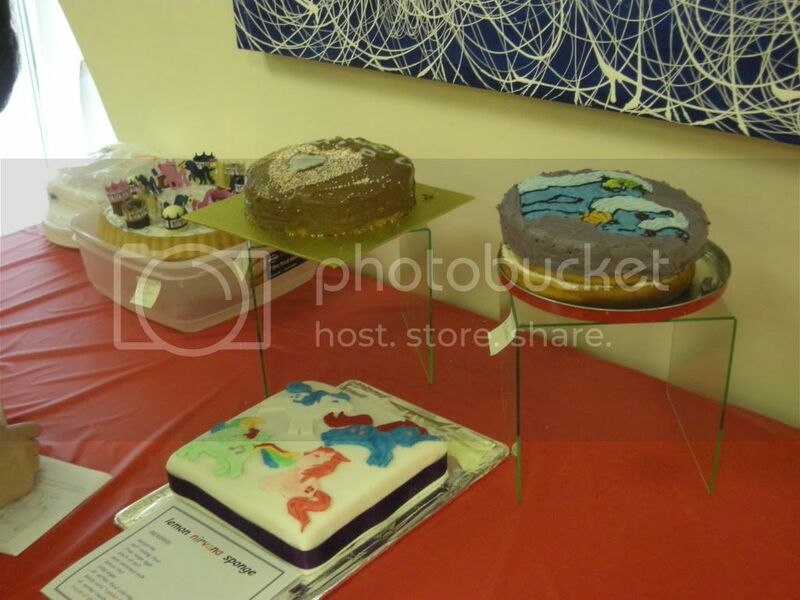 Thursday was Members Day, reserved mainly for people on the UK Ponycon forums. This is the best chance to get to know everyone and generally have a giggle. 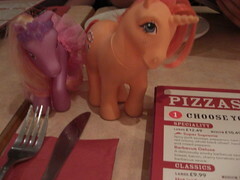 We played games, answered a quiz (Dance n' Prance ponies did come with stacktoys and cowboy hats, right?) and ate lots of delicious cake. Afterwards, I stuck around and helped the constaff (since, heck, I was rooming with one of them) package up the convention exclusive pony. Her name is Fancy Feathers and she is gorgeous. I ALSO picked up G3 Chillie Breezes, despite saying I won't pick up any G3s anymore. Because she has skiing goggles on, ffs. G3s were impossibly cute before the Core7 crap. Anyway, you can find more Ponycon pics here on my Flickr. I didn't take many, sadly. ...which was brilliant, of course. I don't feel like I saw much of the convention this year because I was only there Sunday. I got into London St. Pancras at 8:30 and two wonderful TF2 friends of mine met me and escorted me to the Excel Centre for the Expo! 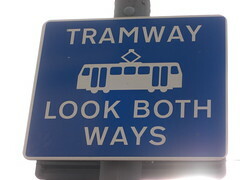 (I didn't fancy navigating London on my own :d). 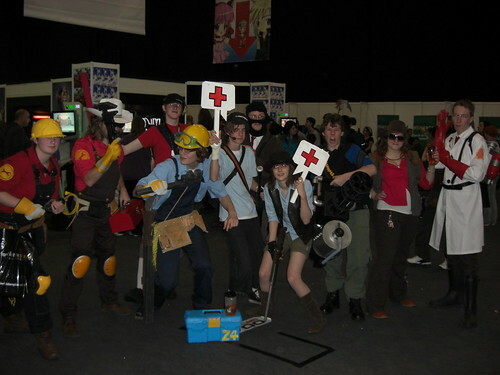 The next day was spent milling around, playing the L4D2 demo (which made me go home and preorder L4D2) and having my photo taken with other TF2 cosplayers, heh. Like the big fat dork I am. Again, you can see the few photos I took here on my supercool Flickr account. Which was just plain awesome. I am a HUGE Queen fan (they're probably my second favourite band after Oingo Boingo) and I love musicals and dramatic cheesy epic stuff, so this one really appealed to me. It was everything I expected it to be! 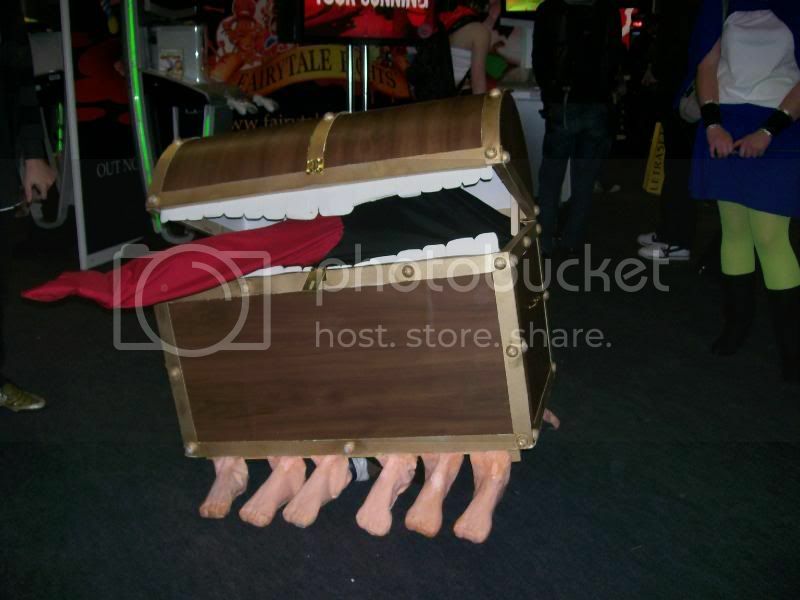 I heard some bad things about it originally but I can imagine they came from people expecting something... different. I mean, it was quite literally a musical about the power of rock music, you know? It was Bill and Ted does Brave New World with a heavy dose of Queen. And I LOVED it. Okay I've been writing this post for far too long so I'm off to do something ELSE for the day. Supersluth Edit! -Now with added ZOMBIES! OH YEAH and so on Halloween lazenich, ugerchucker and I went on the Bristol Zombie walk! It was awesome! It'd been advertised on Facebook before hand I wasn't sure if I could be bothered to go since I'd had such a busy week, but I'm so glad I did! There musta been over two hundred people there easily! We had pretty makeshift costumes, it's amazing what some food dye and scissors can do. :) Thankfully ugerchucker still had some facepaints or else we woulda ended up looking pretty terrible, but I think it all came out great! So yeah that was pretty awesome too. And NOW I'm going. God. And yes, long entry is long. It's okay. I probably won't post again for another month. Was great to finally meet ya at Expo, albeit briefly! HAHA you guys look amazing as zombies! The meat cleaver in the head is an especially nice touch, I must say. Somehow I always manage to miss the zombie walk here, but I'm sure I'll get to it one year. Eventually. Wow, you sure HAVE been busy!! That all looks like so much fun!! That is the best expression on Luke's face in the last photo. Looks like fun was had! Hey you! Wonderful zombie make up. I've missed the last 2 zombie walks here. I am so out of the loop, apparently. Heehee, we're definitely trying to come more often :) It all depends on where the Cons are held and even more so at what weekend (with school and all). I really didn't want you to feel bad about the LJ thing. I got over it ;) Sure feels good to be back tho, haha! It was great finally meeting you even if we didn't hang a lot.